This card is based off the and could apply the Night Express to late night trains. This card's name may be based on an archaic American train coined the Night Express. 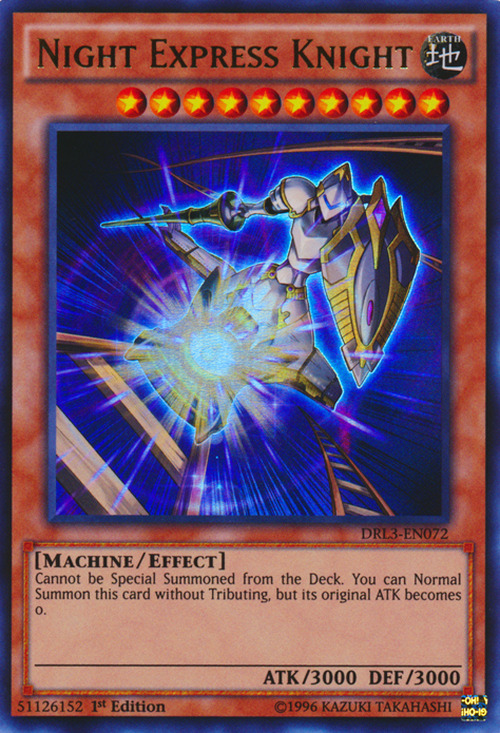 If that's true, this card's name sensibly makes a double pun--it takes after the said train and there is a mechanized knight welded on top of it. This monster appears in the artwork of Urgent Schedule. The "You can Normal Summon this card without Tributing, but its original ATK becomes 0." effect is not a Continuous, Ignition, Trigger or Quick Effect.